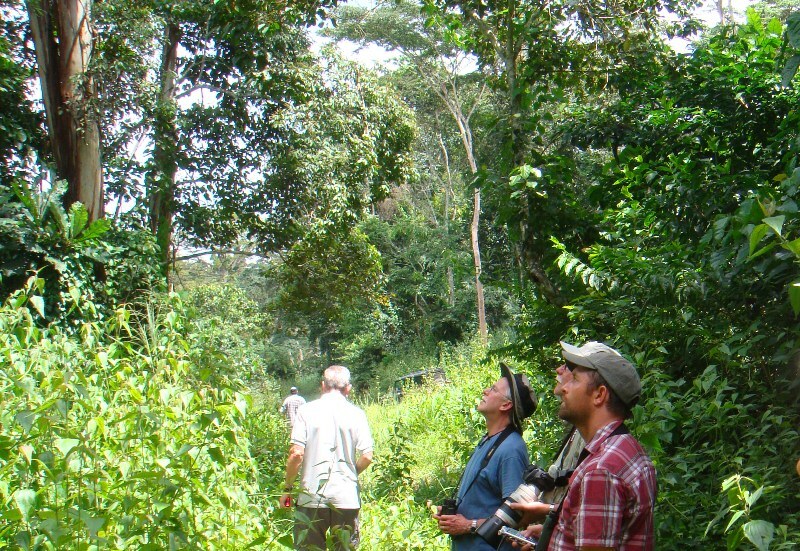 Micheal Mills, in foreground, searching for the Red Crested Turaco. Photo courtesy J. Van Honk. UPDATE: Please note this trip is now full. A birding/camping trip to the Denbos, February 23rd – 24th, with bird expert and conservation biologist Michael Mills. 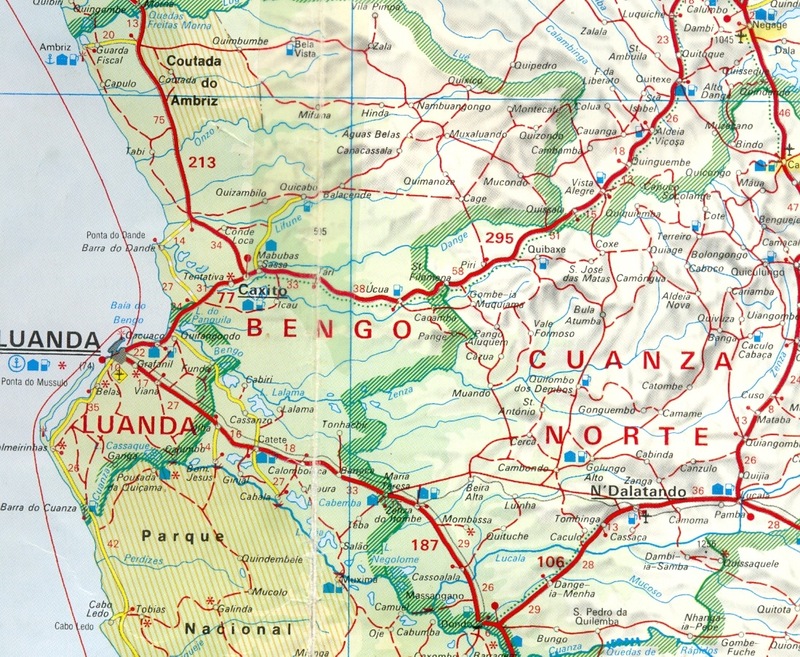 The field trip will take us northeast into Bengo province, past Caxito on the Uige road to Ucua where we will head southeast into former coffee plantation country (scroll down for map). There are still some stands of forests where the rare Turaco, Angola’s national bird, can be found. 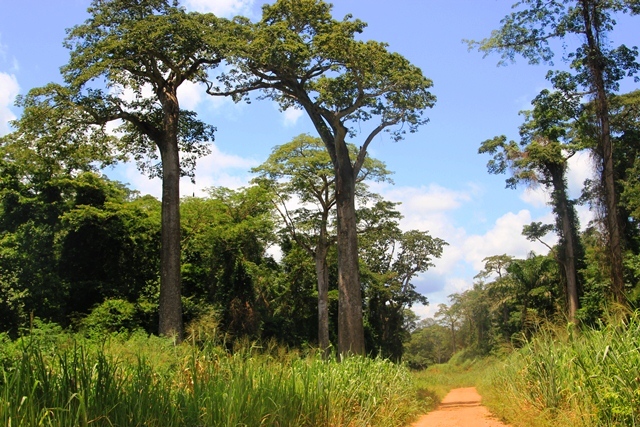 We will camp in the forest and early the next morning we will loop back to Luanda, continuing through the Denbos into Kwanza Norte and back to Luanda on the Catete Road. Participants need to be self sufficient in all aspects of camping. Throughout our journey we will be stopping to look at birds so make sure you have binoculars. One of the side roads in the Denbos leading to some abandoned coffee fazendas which used the naturally occurring tall trees to shade the coffee plants. As this area develops, the trees are being cut down, destroying birds’ habitats. Michael Mills is a professional birding guide (www.birdingafrica.com) and has been coming to Angola to study birds since 2003. He also heads up conservation projects in Angola. Check out his websites on Angolan birds: www.birdsangola.org and www.mountmoco.org. There is a 2000 kwanza cover charge per participant to cover his costs. Click here to download an Excel spreadsheet of Michael Mill’s list of birds seen and heard on the last Angola Field Group trip to the Denbos on Feb. 20, 2011. 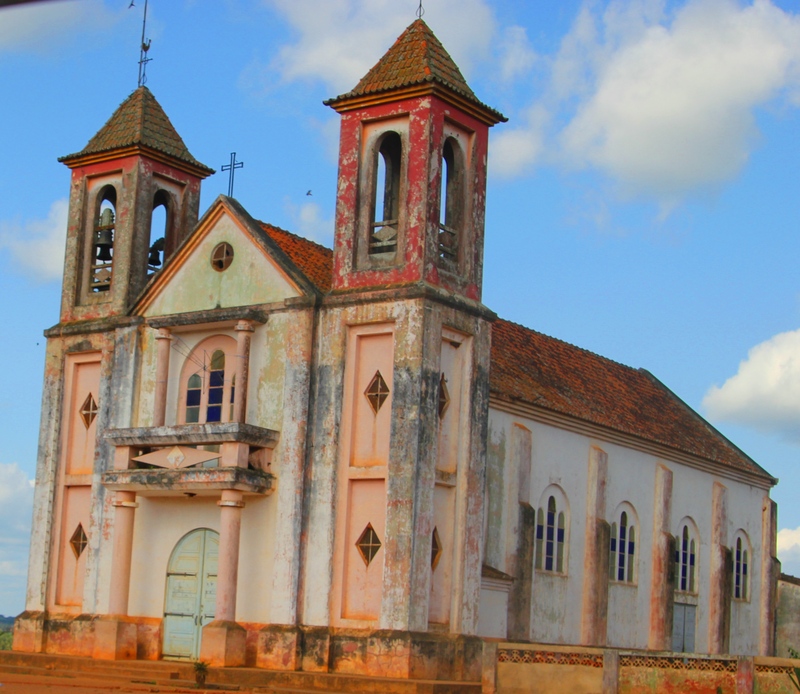 The bigger coffee plantations had a school, clinic and church for their workers plus houses. We must keep numbers to a strict limit so please only sign up if you’re serious about going. We will depart Luanda Saturday at 6:00 AM and plan to be back at 6:00 PM on Sunday. Final trip details including our meeting location will be given once you’ve signed up and are confirmed for this trip. Priority is given to active members of the Angola Field Group. All Angola Field Group trips are at your own risk. Click on map to enlarge, map will open in a new browser window.